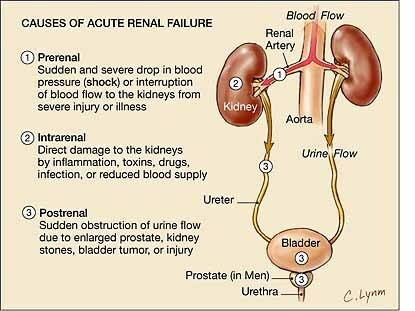 - Pre-renal due to reduction in renal perfusion such as hypovolemia reduced cardiac output, systemic vasodilation and renal vasoconstriction. The kidney is starved of blood and becomes septic and dehydrated. • Casts: aggregate of particulates within urine and usually formed in distal convoluted tubule or collected duct via precipitation of proteins. - Red cell casts: presence of red blood cells within cast and indicative of glomerular damage (glomerulonephritis). - Causes: 90% pre-renal conditions such as sepsis, dehydration, heart failure and low BP. Lack of blood flow compromise viability of cells as renal cells is high ATP dependent. - Mechanism: urine leaks back into the interstitum and pass to blood. - Example: car accident causes haemorrhage and decrease in BP. Patients becomes very dehydrated and high creatinine. If resuscitation does not work, the kidney undergoes ATN. - Rhabdomyolysis: muscle injury causes necrosis of cells and release of cytokine which is toxic to kidneys. - Crescentic glomerulonephritis: due to distribution of immune-complex around the basement membrane, glomeruli give a characteristic crescent appearance. - Crescent formation: capillary rupture from antibody damage leads leakage of plasma protein, with fibrin being the most importance. Fibrin forms clot and epithelial cells of the glomerulus proliferate along with infiltrating leukocytes. Compression of the glomerulus occurs and hence the crescentic scar.